Slip into a pair of Freudian slippers for the ultimate foot therapy session. These plush, comfy slippers will keep feet cozy and supported, and Freud's red tongue will wiggle when you move your toes. Now all you have to do is lay down on the couch and talk about your childhood. Made in China. Small fits Women's 6-8 and Men's 4-6. Medium fits Women's 9-11 and Men's 7-8.5. Large fits Women's 12 & up and Men's 9-11.5. These items have been discontinued. When they sell out, they will no longer be available. We apologize for any inconvenience. I bought these for my roommate's birthday (she's a psych major) and she loves them! For the man who has everything! This gift was for my 24-year son who will be graduating from college in December. I thought they would be used often on those late-night study sessions. So cute with the glasses and tongue hanging out! I bought these for a friend completing his psychology degree. They were great for a few laughs and Freudian jokes. He wears them all the time. I think they give hi Psychology inspiration. Bought these for my wife, who is a shrink, for Mother's day. She loves them. The sale was very smooth and the package arrived before Mother's day, as promised. Great job! Lots of detail on the faces, and your toes go into the tongue - wiggle them and the tongue moves! I bought this for a friend and she LOVED them. She put them on right away & said they were very comfortable. She said she got a lot of positive comments on them. I think they're a great gift to give someone in the mental health field! These slippers are awesome! They're so comfortable. My only complaint is that the tongue part is tighter than the actual slipper part, and that's where your toes go. I tried just not using it, but that makes them fall off very easily. It stretches a bit though, so it's much more comfortable now. Other than that, I love these slippers!!! No slip ups with these slippers. I bought my first pair in 2007 - one pair for me and one for a friend that was also a psych major. They were our instant favorites and we often wore them to class as the sole is surprisingly durable. After 4 years of hard wear & a couple of times through the washing machine, I had worn through all but the rubber. So, I just bought a replacement pair. A must have for any budding psychologist. I even used them as the basis for my senior capstone essay on internal multiplicity, dialogue, and change. They've been a hit at school, at work, at friend's houses, family reunions, and even as after party footwear. Only downside - on this second pair the tongue on the left side is significantly narrower than the right, I might send them back as it seems to be a defect. The original pair was a perfect fit and the right slipper is perfectly fine. I normally wear a 9 but both pairs I've owned have been size smalls. 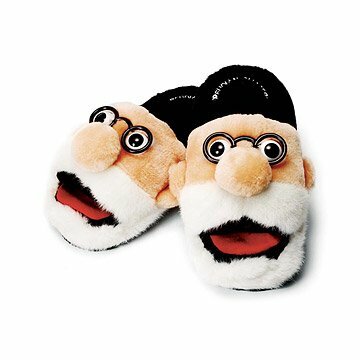 These plush, comfy Freud-inspired slippers will keep your feet cozy and supported.